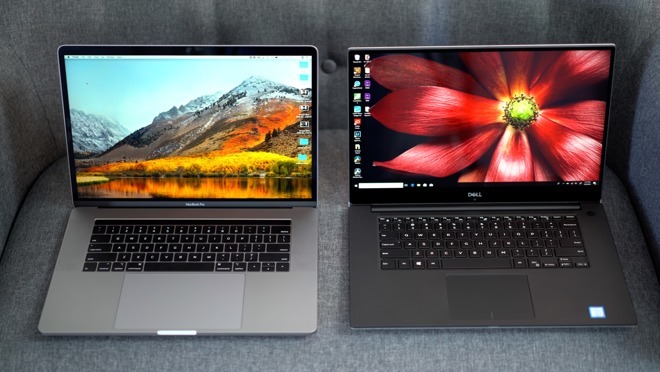 The 2018 15-inch MacBook Pro is powerful and well designed, but can it keep competitors like the Dell XPS 15 9570 at bay? 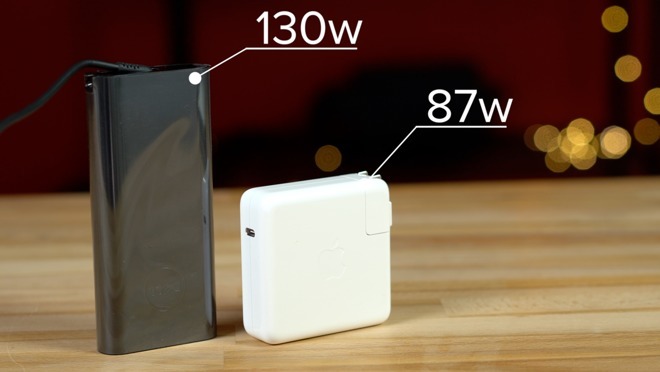 AppleInsider looks at both to see which is the better overall package. On paper, the specifications list suggests you get a lot more for your money with the XPS 15, like double the storage, a higher resolution display with a touchscreen and slightly faster RAM. There's also talk of the Core i9 processor in the XPS outperforming the same chip in the MacBook Pro, but that's only partially true, and something that we will get to later. So, why would anyone pay more for a MacBook Pro? 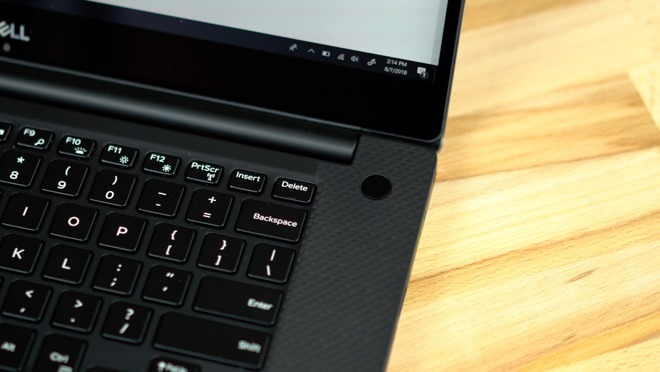 There's many reasons, including security, the Apple ecosystem, reliability, resale value, design, macOS, and the Apple brand itself, but in this case we are concerned about which notebook offers the best overall experience. 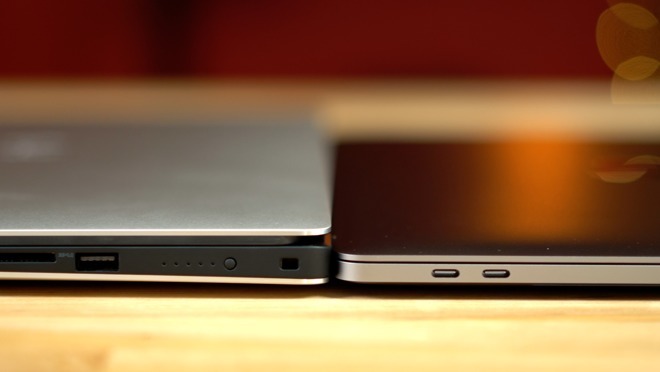 Both notebooks are similar in size and weight, but the MacBook is noticeably thinner. Most people would agree that the XPS's design isn't as nice as the MacBook's all-aluminum construction, but it still looks and feels great. Perhaps the worst part about the XPS's design is that it's extremely difficult to open the notebook with one hand. On the MacBook Pro, you can lift the lid from the body just using your pinky finger. The XPS does offer a lot more variety in terms of ports, like an SD card slot, a couple of USB 3.0 ports, an HDMI 2.0 port, and a single Thunderbolt 3 port which with support for up to 40Gbps speeds. The MacBook Pro simply has 4 full-speed Thunderbolt 3 ports, with all four supporting any device you will ever need, but only with the right cable or dongle. This may be a deal breaker for many, but USB-C cable prices have recently reduced in price, making it less of a problem. 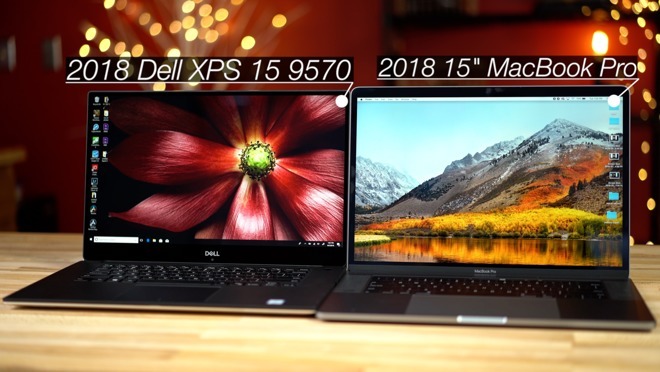 There is no doubt that the XPS has the better display, with thinner bezels and 4K resolution, beating the MacBook Pro's 2.8K display in almost every way.The downsides for the Dell is that the screen isn't as bright, it's a bit more reflective, and it forces the webcam down below the screen for an unattractive camera angle. Higher resolution displays tend to use more battery power as well, but the XPS does have a larger 97 watt-hour battery compared to 83.6 on the MacBook Pro, so battery life should balance out. Charging is also better on the XPS on paper, as it ships with a 130-Watt power supply compared to the 87-Watt version for the MacBook, so it should technically recharge faster as well. 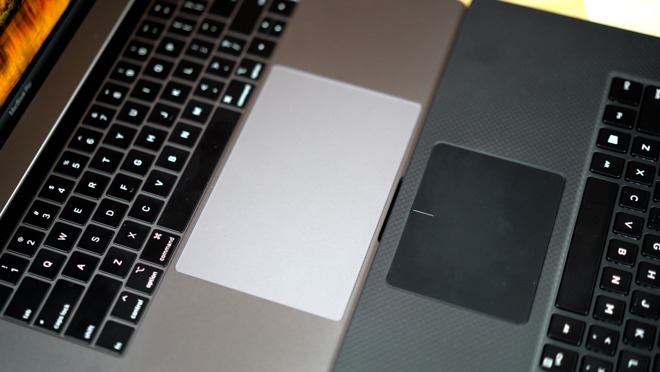 The trackpad is likely one of the best for Windows laptops, but it's still lagging behind Apple's Force Touch trackpad, which is roughly twice as large and has a perfectly even feel no matter where you press. It can even be adjusted to the users preference, making it hard to produce a competing version that adequately challenges it. The keys on the XPS are fairly quiet, with good travel and a quality feel, resulting in a keyboard we think most will prefer compared to Apple's minimal-travel butterfly keys. Apple did add a silicon barrier beneath the keys to fix the dust and debris issue, potentially making durability issues a thing of the past. The volume from the speakers build into the XPS is good enough for most situations, but the sound quality is subpar and the speakers fire to the bottom, which is fine if it is on a desk, but will get muted when used on a lap ora soft surface. The MacBook speakers face the user with much more bass, clean mids, and crisper highs. The MacBook Pro comes with the Touch Bar, and we honestly think it's mostly a gimmick. 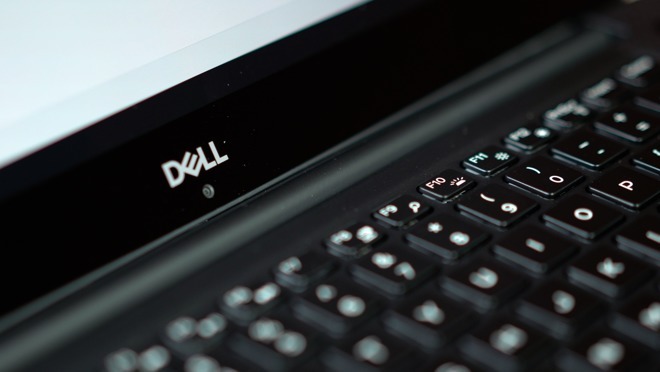 The exception is Touch ID, the fingerprint-reading security feature that is also available on the XPS. However, the Touch Bar model comes with Apple's T2 chip, which takes care of a bunch of system controllers on behalf of the processor. This includes providing automatic SSD encryption which doesn't noticeably slow down the main storage, something which used to be the biggest drawback of encrypting your main drive. The T2 chip also enables "Hey Siri" on the MacBook, and with macOS Mojave coming soon, you'll be able to use it to control your HomeKit devices. The MacBook Pro's fingerprint sensor has the upper hand because it's backed by hardware encryption, allowing you to use your fingerprint for things like Apple Pay purchases. 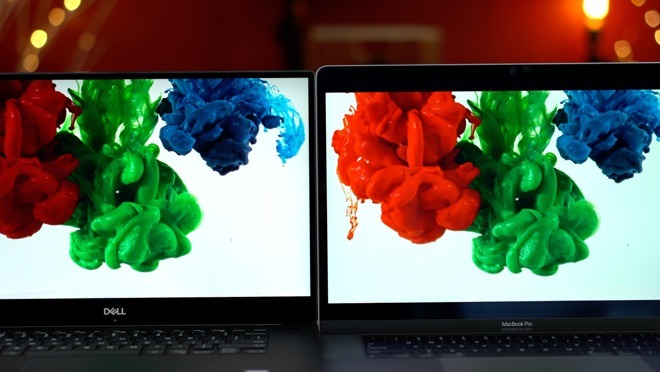 As noted earlier, both notebooks have the same exact processor, but the XPS is loaded with Nvidia's Geforce 1050TI graphics card, which is quite a bit faster than the Radeon Pro 560X in the MacBook Pro. 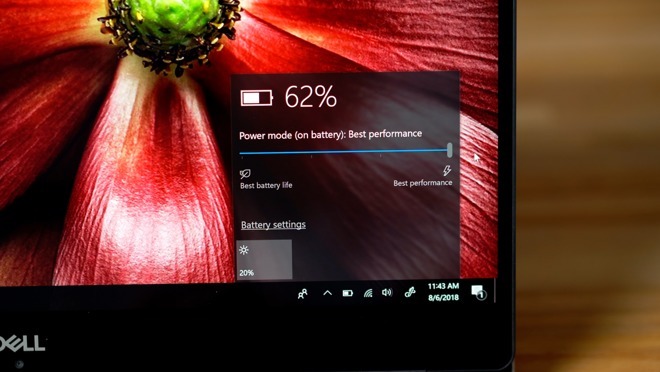 Right out of the box, the XPS 15 will not run at full performance, requiring a change in the battery performance settings to allow it to run at maximum capacity. Starting with Geekbench 4, we noticed that the MacBook Pro scored way higher in the multi-core test, despite scoring lower in single-core. This seemed a bit odd as they're both using the same exact chip, but then it was discovered the i9 in the XPS 15 won't run at full power unless the charger is plugged in. A retest with the power adapters plugged in showed the XPS as running at around the same performance as the MacBook Pro. As with the battery, we also had to turn up the performance slider on the XPS for plugged in mode as well. Plugging in the MacBook Pro made absolutely no difference at all, with it providing the same results regardless of whether it was running from its battery or from the mains. The Cinebench R15 stress test, which is run four times back-to-back, was run at first with the power adapters plugged in. After starting the first run, we noticed the wattage for the XPS hit a peak of 77 Watts, and once the temperature hit 97 degrees, the processor dropped down to an average of 55 Watts and 85 degrees celsius. We also noticed that the clock speed was very steady, staying above 3.2GHz most of the time with a one-time spike down to a low of 2.6GHz. The XPS scored 1183 on the first run, then 1104, then 1081, and finally 1061, for an average of 1107 points. The gradual decrease in scores shows that it's suffering from thermal throttling in later test runs. A repeat on battery power showed the processor hitting a maximum of 46 Watts, far lower than the 77 we saw while charging. Temperatures only hit a maximum of 85 degrees, and only for a split second after starting the second run. Overall temperatures stayed at an average of 80 degrees, which proves that the thermals aren't behind the huge drop in wattage. This means that the battery isn't putting out enough power to bring the i9 to its full potential without the power adapter being plugged in, which is possibly bypassing the battery altogether. It is unclear if this is due to a hidden battery saving measure, or the battery itself isn't able to put out that much voltage. It was also noted clock speeds were all over the place while on battery power, hitting a shockingly low 1.2GHz multiple times. On battery power alone, the XPS scored 969 on the first run, 955 on the second, then 959, and finally 968, for an average of 962. This is quite low compared to when it is plugged into the charger. For the MacBook Pro on battery power, the peak was 83 Watts on the first run, before averaging out to about 45 Watts. Temperatures shot up close to 100 degrees celsius shortly after starting each run, but quickly cooled down to around 93 degrees, before slowing heating up to around 95 degrees before each run finished. The average clock speed hovered around 3.15GHz, but didn't drop below 3.0GHz at any time during the test. The MacBook Pro scored 1053 on the first run, 979 on the second, then 1009, and finally 1029, for an average of 1017 points. The reason the second run scored so low is because the fan was a bit late to ramp up in speed, but the temperatures dropped once it did kick in, allowing for higher clock speeds and an increase in scores. The MacBook Pro was 5 percent faster than the XPS on battery power, but while plugged in, the XPS 15 is 9 percent faster than the i9 MacBook Pro. In the graphics testing, the XPS greatly outperforms the MacBook Pro, even under battery power, although the Geekbench 4 score did drop by 10,000 points. Running Unigine Heaven's gaming benchmark, the XPS scored 48 frames per second, more than double what the MacBook Pro scored. After unplugging the chargers, the XPS dropped down by a few FPS, and the MacBook Pro got the exact same score as the plugged-in run. Now let's see if these drops in performance translate to the real world by testing photo and video editing performance. Using Lightroom Classic to edit 42MP RAW images, the MacBook Pro was perfectly smooth when using sliders in the develop module, whereas the XPS had a slight lag. Exporting 100 RAW images to JPEG, the MacBook was just 3 percent faster on wall power, taking 5 minutes and 57 seconds compared to the XPS with 6 minutes 7 seconds. The results didn't change when on battery power, but it's important to note that the MacBook Pro's fans runs quieter even with the machine completing the task slightly faster. 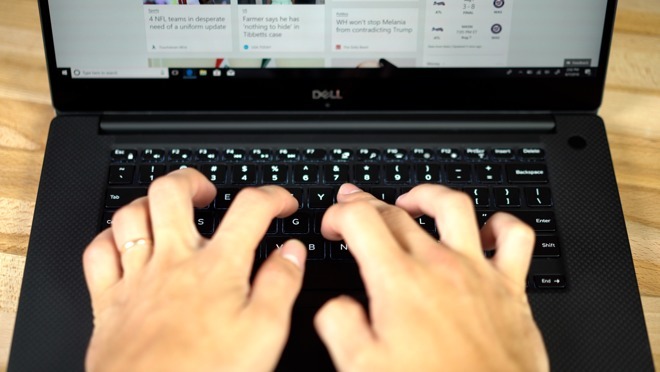 The lag from adjusting the sliders is probably caused by software optimization differences between the operating systems, since the XPS technically has the same or better specifications. Moving on to video editing, we exported a 5 min 4K h.264 project with effects using Premiere Pro on both machines, along with Final Cut Pro X on the Mac for software comparison. The XPS 15 was much faster at rendering and exporting the test project, especially when plugged in, taking 9:06 compared to 22:38. On battery power it slowed down to 12:22, but was still about twice as fast as our Mac. Monitoring system utilization, the XPS i9 processor was being utilized at around 35 percent while the MacBook's was higher at around 50 percent. The graphics was a different story, with the Dell 9570 at around 90 percent GPU utilization whilst the 2018 15-inch i9 was only around 20 percent. The XPS 15's higher GPU load not only decreased rendering times, but also meant the CPU could run at higher clock speeds, averaging around 3.5GHz compared to 2.8GHz average on the Mac. Using Apple's own software shows how optimized software and hardware can be, making much better use of both the processor and GPU and taking just 3 minutes ad 44 seconds to complete the task. Taking a look at a similar project but using 4K HEVC files exporting to HEVC, here the MacBook Pro is superior, finishing in 5:39 compared to the Dell at 7:36 on wall power, and 10:13 on battery. Testing this with Final Cut Pro X, the result is a shockingly quick 46 seconds. As with all other tests, that high speed was achieved with background rendering turned off, making it even more impressive. Finishing off with 4.5K RED R3D RAW files, the Dell dominates here, with a time of 2:12 when plugged into the wall, slightly beating the MacBook Pro in Final Cut at 2:22. Switching to battery power, the XPS' time almost doubles to 4:14, and the Mac in Premiere takes a much longer 7:34. This is impressive for a laptop editing RAW files, especially with Premiere, and that is because both the CPU and GPU are used close to their maximum capacities, and that's also why when we unplug from the wall, the time slows down dramatically. While editing, the XPS constantly ramps fans up and down, and it gets annoyingly loud. The MacBook Pro may lose on performance since it throttles more, because it runs its fans slower and more consistently, but it's more enjoyable to use. 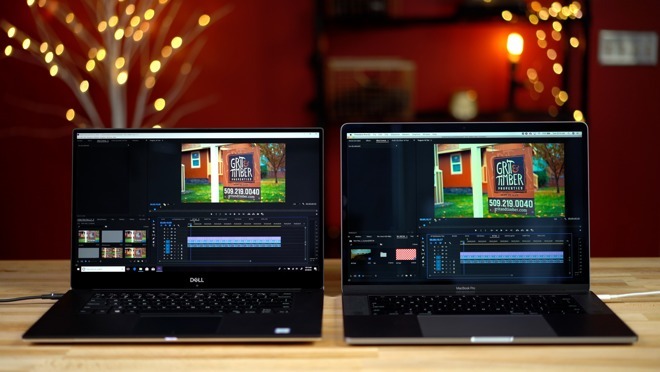 In Final Cut, the timeline is very smooth while editing, while in Premiere, the XPS does have an advantage because of its more powerful graphics, but both machines have some stutter once you add color corrections, titles, and effects. The 2018 Dell XPS 9570 is a good choice for anyone not currently tied to the Apple ecosystem, and needs the extra graphics performance, especially those using Premiere Pro. It does slow down significantly under battery power, but it's still quite a bit faster than using Premiere on our top of the line MacBook Pro. Gamers and the cost-conscious will probably have a better experience with the XPS 9570. You also get double the SSD capacity for a lower price, and a wide variety of ports including a SD card reader. However, the 2018 MacBook Pro is more refined, with a much better trackpad, better speakers, camera, the dedicated T2 chip and all of it's added features, and of course MacOS which we strongly prefer to use. On top of that, for changes between 2017 models and 2018, Apple looks to have fixed the biggest issue surrounding the MacBook Pro: the butterfly keyboard. 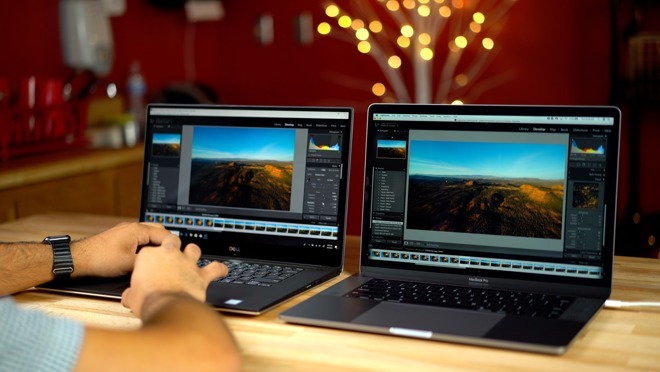 Add in the fact that you won't get any slowdowns on the go compared to the XPS, and the MacBook Pro continues to be an attractive proposition. Those interested in the 15-inch MacBook Pro can save $100 on every 2018 model at Adorama with promo code APINSIDER. To activate the deal, you must use this shopping link or the pricing links in our MacBook Pro Price Guide prior to entering the code. Along with the exclusive discount, the Apple authorized reseller will not collect sales tax on orders shipped outside New York and New Jersey, and no interest financing is available when paid in full within 12 months when you sign up for the Adorama Credit Card. For help redeeming the coupon code, please see the step-by-step instructions found in this guide. 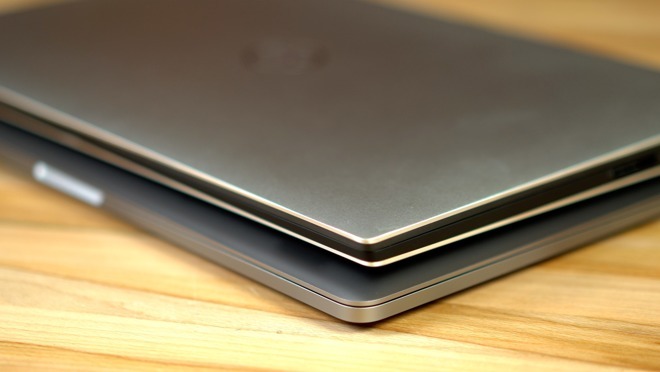 Prefer the Dell XPS 15? Dell is currently discounting the Core i9 XPS 15 by $160, bringing the cost of the model we tested down to $2,799.99. App Roundup: PGA Championship 2018, The Views News, Instapaper Premium, more!